WHERE: Pigeon Forge, Tennessee nestled in the Great Smokey Mountains East of Knoxville. The Pigeon Forge StarQuest meet has been taking place for about 20 years now believe it or not and it has become a staple in Starion owners' schedules every year. It has become a habit to just automatically converge in Pigeon Forge and hang out for the weekend. Talk cars, BS, and bond. For many, this meet is the only time we see each other. It's become something special to us. Not just a car meet, but a family reunion. 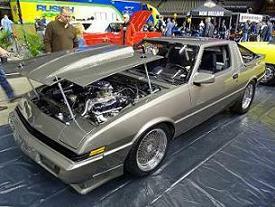 In years past, it has attracted nearly 50 of StarQuestClub's finest examples of Starion and Conquest, be it flatbody or widebody. 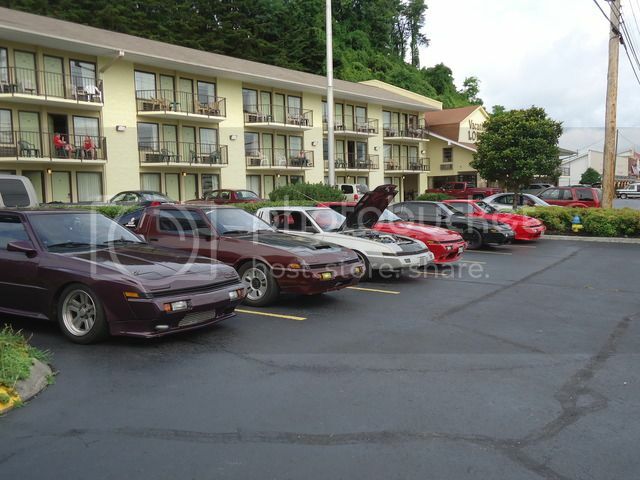 From mountain road cruises to group dinners, drunken gokarting to drunken circle conversations in the parking lot, to strong everylasting friendships, the Pigeon Forge Starion meet has something for everyone that keeps people coming back every year. We're looking forward to the naming the 2019 meet the "Nationals". We encourage everyone from all over the country to come out and spend a greater part of the week with us and enjoy what Tennessee has to offer. Beautiful scenery, awesome roads, delicious food, and stunning cars. I spoke with the manager and she gave us group rates for PF19. Be sure and request room rates for the Starquestclub group. I will block 20 rooms for your group and hold them until May 1, 2019. I will release the room block on May 1, 2019. They need to call and book their reservations by May 1, 2019 in order to get the discounted rate. I will not be able to hold any rooms after the May 1, 2019 cut off date.. In order to get the discounted rate per night, you must stay the nights of July 4, 5 and 6. Other nights are available at the same discounted rate per night. Here is a price list per night for July 4-5-6, 2019. We are in the process of building a new facility which will house a new breakfast room, an indoor pool with hot tub, guest restrooms, a guest laundry, and four 2 bedroom family suites. The grounds area around the outside of the facility is projected to have a picnic area with grill and fire pit. There will also be an extra parking area. Edited by Coke, 20 March 2019 - 07:55 AM. I'm not sure if it'll be this year or not, but I'd love to drive out to this one of these years - def. a bucket list item. Thanks for posting Coke! Techboy, where would you be traveling from? You have some time to work it out. We're still working out hotel accommodation pricing, but we should have this information nailed down real soon. I'm in PA, Lehigh Valley area, which is north of Philly. You still living in the Rochester area? I almost had to go there again this past summer for a training, but I ended up at a site on Long Island instead. If I had to go back to Rochester, I was gonna give you shout. Ah okay. My neon was painted and put back together in Northampton/Cherryville area. I've been down there a few times over the Spring/Summer working on it at my buddies shop. It's all done and back home now, though. Yeah, I'm still about an hour west of Rochester still. What is the turn out been like the last few years? I'd love to make the long drive out there for this since the car is now done and I've sworn to not tear it apart for a few years LOL. Well to be completely frank, the turnout in the past few years has been shrinking. I think last year we had less than 10 cars. However, I feel a reason for this is the lack of publicity, hype, and "variety". This year, it is our mission to breathe some fresh life back into the meet. We're trying to find ways to make the meet less vanilla, and more cherry. Deeming it a "National Meet" is just one way to try and reinvigorate the event. There is a StarQuests at Pigeon Forge Facebook with general discussion of the yearly meet, but Chris Martin "helrazr" created another group specifically for new ideas and 2019 planning. Everyone is encouraged to join the groups and become involved in the talk and discussion there, and by all means, here too. Edited by speedyquest, 05 December 2018 - 02:48 PM. Isn't that what we're doing now? Very true, I just didn't know if you'd want to fill this topic up with discussion about it or not. But I guess my thing is I want to meet more members and also I enjoy road tripping so it seems like a perfect mix of the two. I know a fair bit about it just because I've been on here so long. I just didn't know if it was still super popular or not. If you have questions about my opinion on things from an outside perspective or from the viewpoint of someone traveling a long ways or never having been before feel free to ask. Yes, let's fill this up with anything to do with the meet! I added information to the original post. Even if you car is blown up or in pieces or whatever the case may be, we still need to get everyone out there. It's the people that make the meets, the cars are just a plus! My family and l have been down there on vacation couple of times for the 4th of July and stayed in Gatlinburg. I have seen bunch of starquests parked in front of one of the hotels and pulled in to check them out but no one was around. There is a possibility we come this year to make some friends and check out all the cars. Edited by croquest87, 06 December 2018 - 06:59 AM. Chances are, everyone was in the parking garage hanging out. We would love to see you come this coming year. this is ALWAYS a great gathering of cars and people. some years there are more than 25 cars, some not, but it doesn't matter because the same thing always happens, we have a great time together. plan on making it, i feel this year will be 40+ cars showing up you don't want to miss this one ! It will be a solid 14 hour drive for me and I'm still wanting to go. Doesn't deter me in the least!